My breastfeeding journey began the year I married my husband, 2002. We moved to Glasgow for 12 months while I completed my Masters degree in Nutrition at the University of Glasgow. I can’t say that breastfeeding was even on my radar at that point. I had no children, didn’t remember ever seeing anyone breastfeeding and I was barely breastfed myself so it wasn’t regular conversation in the Blackburn house. I was introduced to breastfeeding during my time at the University of Glasgow by the wonderful Dr Jane Scott. It just sounded so logical, there are so many benefits and I just wondered why anyone would want to do anything else after knowing about it. I wrote my thesis on the effects of pain relief during childbirth on breastfeeding success. It was quite eye opening. I continued to learn about nutrition and breastfeeding when we moved back to the States and I was very lucky when I was hired as a Nutritionist with the WIC Program (Women, Infants and Children’s Supplemental Nutrition Program). The WIC Program marries my two passions for nutrition and breastfeeding and I spent 6 fabulous years working with an amazing team of women to promote and support families to breastfeed and live healthier lives. It was during this time that my husband and I became pregnant with our first child. Working alongside women who considered breastfeeding as the usual way to feed a baby and that 2 years and beyond was perfectly normal meant that I never questioned my ability to breastfed and gave me an amazing wealth of knowledge and experience to draw from. I wouldn’t say that our first breastfeeding journey got off to the best start. It’s definitely something that I learnt from and second time went like clockwork. My friends, colleagues and family supported me throughout our journey and William chose to stop nursing at 2 months shy of 4 years old. “The Breastfeeding Network’s Drugs in Breastmilk helpline provides support and information to thousands of families and health professionals every year. Our highly experienced and trained pharmacist offers breastfeeding support alongside evidence based information to anyone who is concerned about the effects of medication or treatments while breastfeeding. We have a dedicated helpline number and email address, as well as a range of information sheets on a wide variety of topics. Currently the Drugs in Breastmilk helpline service receives no external funding and last year our #savedrugsinbreastmilkhelpline campaign was a huge success with hundreds of mums and health professionals proclaiming their love for our unique support service, and generously donating to help save this vital resource, which was at risk of closure due to lack of funds. As a result of this, we’re very excited to launch our brand new ‘Friends of Drugs in Breastmilk Helpline’ scheme”. 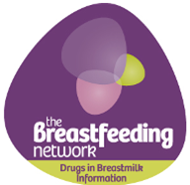 If you or your business would like to become a friend of the Breastfeeding Network Drugs in Breastmilk Helpline by donating to this amazing service then visit the website for more information HERE. 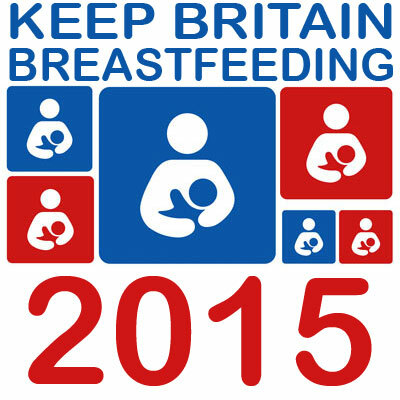 Keep Britain Breastfeeding Scavenger Hunt 2015 - Positive About Breastfeeding! It's almost August, and the kids are out of school in the UK and this can only mean one thing, World Breastfeeding Week is fast approaching and that means that Keep Britain Breastfeeding is beginning to take shape! 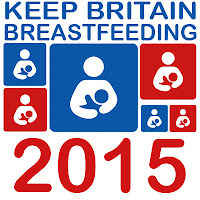 World Breastfeeding Week takes place every year from August 1st to August 7th and everyone can take part in some way. The them this year is Breastfeeding and Work. There are already at least 30 bloggers, 1 organization and 13 companies providing lots of fabulous prizes for the winner of the Scavenger Hunt. I hope you are looking forward to taking part and reading blog posts on the following themes throughout the week, there are always amazing posts written so do pop back and tell me your favourites. If you blog and you want to join the hunt through your blog by writing about your breastfeeding experiences, opnions and knowledge then let me know! You can also ask friends and readers to guest post for you. If you like running competitions you can partner with breastfeeding friendly companies to run additional competitions throughout the event. If you are a company and you sell any breastfeeding product or service or you just love breastfeeding and happen to run a company that sells products or services to pregnant and breastfeeding women and their families then get in touch. We would love you to join us in creating an amazing package of goodies for the event winner. Throughout the week you will find out about all the posts that have been published by all of our lovely bloggers, as well as additional competitions and special offers taking place with our lovely companies. Each blog post will have the KBBF logo and a rafflecopter at the bottom of the post for you to use to make your entries for the main prize. The rafflecopter will be just like the one posted below, so use this as your test run and make your first entry to be eligible for the main competition prize.